Craps, like many other casino games has a number of different rules and strategies depending on where you play. At heart however, I’ve found Craps an extremely simple game to grasp. Lots of people can join in at the casino and even newcomers can make the popular bets without any prior knowledge to the rules. As a top line explanation, playing craps is about betting on the different rolls of the dice. The basic rules of Craps in casinos are covered below. In every round there is a player who throws the dice, this player is known as the shooter. Everybody at the table take turns being the shooter in clockwise manner although you can choose to skip if you wish. One requirement of the shooter is that he must pay the table minimum on either the “Pass” or “Don’t Pass” line. This enables other players to bet on the roll during the game’s multiple rounds including side-bets, lays free bets and proposition bets. All other players can bet on either the “Pass” or “Don’t Pass” line. When it’s your turn to roll the dice you need to hold them in one single hand and throw them so that they hit the back end of the table. This ensures randomness and prevents anyone suspecting you of cheating or dice control. When the shooter roles he must establish a “point”, this is known as the “Come Out” round. If the shooter roles a 2,3 or 12 then all “Pass Line” bets lose. The “Don’t Pass Line” bets have the opposite effect, they win on 2 and 3 but push on the 12 (draw). A 7 or 11 rolled at his stage is a win for the “Pass Line” or loss for “Don’t Pass” bets. The shooter continues to role until he hits a number not mentioned (4,5,6,8,8,10), this becomes the point. This is what the following bets are based on. The dealer button is moved onto the point to make it clear for others. When the point is “On” then the point has been established. If it is “Off” then the point has not been established and in game is in the “come out” round. Once the point is determined, a player continues to role until they either roll the point number, or a seven. If the point is rolled, then everyone who bet on the pass line wins, and the don’t pass betters lose. PLAY CRAPS AT BOVADA CASINO TODAY! The above covers the basics to Craps. But there is much more to the game than the above. There are a wide variety of single-role and multi-role bets than can be made after the “point” is established. These have different odds and meanings that add more depth and possible confusion to the game. I think the complex terms and lingo can put a lot of newcomers off but in general it shouldn’t take long to learn. Once you understand the etiquette, structure and betting system, Craps is a pretty simple yet exciting game. If You’d like to play craps online right now, I suggest joining Ricardos Casino and claiming their $7 No Deposit Bonus! There are also different variants of the game including Street Craps (without house), Crapless Craps, Die Rich Craps, High Point Craps, New York Craps and Simplified Craps. A lot of these versions were created by individuals who wanted to play the game outside casinos and remove the house edge. Crapless Craps, for instance, removes the possibility of losing to Craps on the Come Out roll which improves your expected value from the game, making it more profitable. 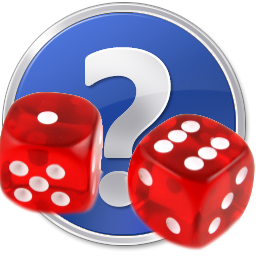 Craps is played with two identical six sided dice and craps is a dice game where everyone plays against the casino. A craps table is twice as big as a blackjack table, where 16 gamblers can play at it. Each end of the table is a mirror image of the opposite, all in the effort of having twice the participants play. As I already said, craps is played with a pair of six sided dice, making for (6×6) 36 possible combinations, pretty close to roulette, except the odds are a little different, as different combinations combine to the same totals. 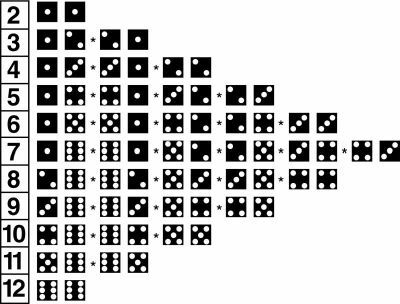 Since only one combination of two dice can give you a total of 12 (6 and 6), the odds of rolling a 12 are 1 in 36. On the other extreme, you have six ways to make a total of 7 (1 and 6; 2 and 5; 3 and 4; 4 and 3; 5 and 2; 6 and 1), which produces a probability of 6 in 36, or 1 in six that you will roll a 7. Have a glance at the chart below to see what combinations account for which probabilities. So, the chart you have looked at gives all the information that you need to know about a pair of dice if you want to try to anticipate the outcome of each roll. Also, this is the only common sense way to do that. Do not believe in systems that say that the chances of a particular total being rolled depends somehow on the last total that was rolled. This is an erroneous belief and you should avoid it. If you flip a coin nine times and it’s heads every time, the probability of it being heads on the tenth flip is still 50%, not any less, no matter what you’re betting brain may try to tell you. After looking at the chart you will notice that everything revolves around the seven, rather symmetrically. A six is as likely as an 8, a five as likely as a 9, and so on. To calculate the odds, take the number of ways to get a number divided by the number of ways to not get that number. You have only 3 ways to roll a 10, and 33 ways not to and therefore the odds are 33:3 or 11:1. More important for craps is the ability to calculate the odds of something being rolled before a seven. In order to do this you take the number of ways to roll a seven (6) compared to the number of ways the make the other number, let’s say 5 (there are 4 ways to make a 5); so your odds against rolling a 5 before a 7 are 6 to 4 (reduces to 3 to 2). Note the difference between the probability and odds of rolling a number. The probability of rolling a 10 is 3 in 36, or 1 in 12. The odds of rolling a 10 are 1:11 (read as 1 to 11). Either way, out of 12 rolls, chances are a 10 will come up once (one 10 and 11 non-tens). To add more confusion, when someone normally talks about the odds of rolling a ten they really state them as the odds *against* rolling a ten; so you’re more likely to hear ‘the odds against rolling a ten are 11 to 1’ (sounds more familiar right?). Hopefully that makes sense, because it certainly took me a minute to figure out what I was saying.